Two major firmware updates 1.70.14 and 1.70.15 are now available for our FreeMile and CFIP-106/108 FODU radios. The firmware update includes critical embedded OS buffering fix, support of NTP (Network Time Protocol), 64bit counters and more. To learn more about the updates and what they include, please visit, the downloads section on our website. Our path calculator continues to be our biggest web addition yet, now with more updates. We have added to the list CFIP-106/108, Marathon II 0.3GHz, and Marathon II 0.4GHz and made some bug fixes. Our path calculator is one of a kind in the market. The intuitive interface and precise calculations allow you to receive essential details on the planned project immediately. Just by filling in the address or dropping pins on the map, you can get an instant link calculation. Right now it is available in the late Beta version for registered users only. Check out SAF's Path Calculator. Tele2 is one of the biggest Swedish mobile operators with more than 14 million clients across Europe. Recently they were facing a challenge with one of their XPIC links where it signaled high BER value in the link's horizontal polarization. SAF's Spectrum Compact was chosen as the tool to solve this issue. Click here to read how the problem was solved. The contest ends on the 31st of December. 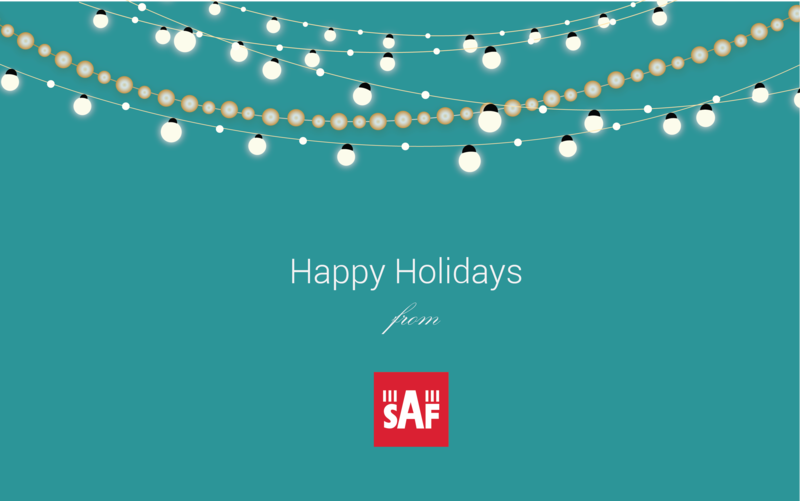 Our team wishes you a wonderful holiday season! According to the agreement No. SKV-L-2016/152 concluded between „SAF Tehnika” JSC and government institution „The Investment and Development Agency of Latvia” of a project „Participation of „SAF Tehnika” JSC in international exhibitions”,on November 15-17 company exhibited at AfricaCom 2016 in Cape Town, South Africa. According to the agreement No. SKV-L-2016/152 concluded between „SAF Tehnika” JSC and government institution „The Investment and Development Agency of Latvia” of a project „Participation of „SAF Tehnika” JSC in international exhibitions”,on October 6 company exhibited at "The Trading Show 2016" in New York, USA. Draft resolutions of ordinary shareholder's meeting on 28th of November of SAF Tehnika JSC can be found in pdf document seen below. The 12th December 2016 has been set as the planned date on which the list of shareholders, who will be entitled dividends, will be fixed. For Q1 of the FY 2016/2017, the Group's unaudited consolidated net turnover was EUR 3.82 million, which is by 8% or EUR 0.28 million, more than in Q1 of the FY 2015/2016, and by 3% more than in the closing quarter of the previous financial year. The Group finished Q1 of the FY 2016/2017 with profit of EUR 401 thousand (unaudited), which is by 109 thousand more than in Q1 of the previous financial year. The major part of the Q1 turnover (69% or EUR 2.6 million) was made by sales in North/Latin Americas and was related to the development of data transmission solutions and products tailored to specific customer needs. This region’s result is by EUR 1.2 million greater than in Q1 last year and exceeds the result in the preceding quarter by 25%. The European and CIS region gave 27% of the turnover in Q1. The region’s turnover decreased by 27% as compared to the same quarter of the previous FY. The above fluctuations are related to the implementation of individual projects. The Group finished Q1 of the FY 2016/2017 with profit of EUR 401 thousand (unaudited), which is by 109 thousand more than in Q1 of the previous financial year. The Group had a positive net cash flow during the first three months of the financial year, equaling to EUR 64 thousand. As of the end of the reporting period, the net cash balance was EUR 5.8 million. 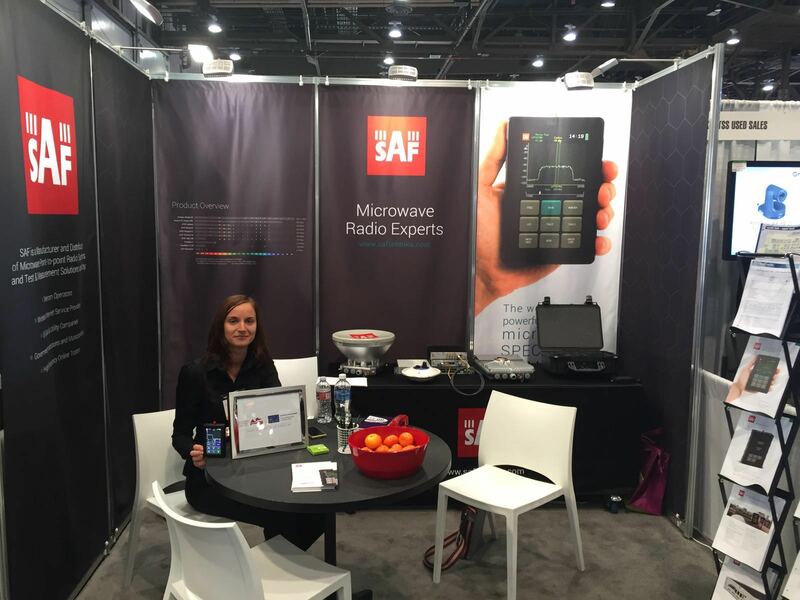 SAF Tehnika is the company with the long-term competence in development and production of microwave radios. The Group continues to explore market requirements and problematic issues in order to be able to provide necessary product modifications. The Group is financially stable. The goal of the Company is to stabilize sales levels to ensure a positive net result in the long term. The Board of SAF Tehnika maintains cautious optimism, but cannot provide a sales and performance forecast. „SAF Tehnika” JSC is an ISO certified wireless data transmission equipment manufacturer. The company's products are produced in Latvia, Europe and sold in over 130 countries worldwide. „SAF Tehnika” has been listed on NASDAQ OMX Riga since 2004. SAF Tehnika wholly owns subsidiaries “SAF North America” LLC and “SAF Services” LLC. Both of the mentioned companies are operating from Denver, CO, USA serving North American market. According to the agreement No. SKV-L-2016/152 concluded between „SAF Tehnika” JSC and government institution „The Investment and Development Agency of Latvia” of a project „Participation of „SAF Tehnika” JSC in international exhibitions”, on October 11 – 13, 2016 the company exhibited at “WISPAPALOOZA 2016” which took place in Rio All-Suites Hotel & Casino, Las Vegas. 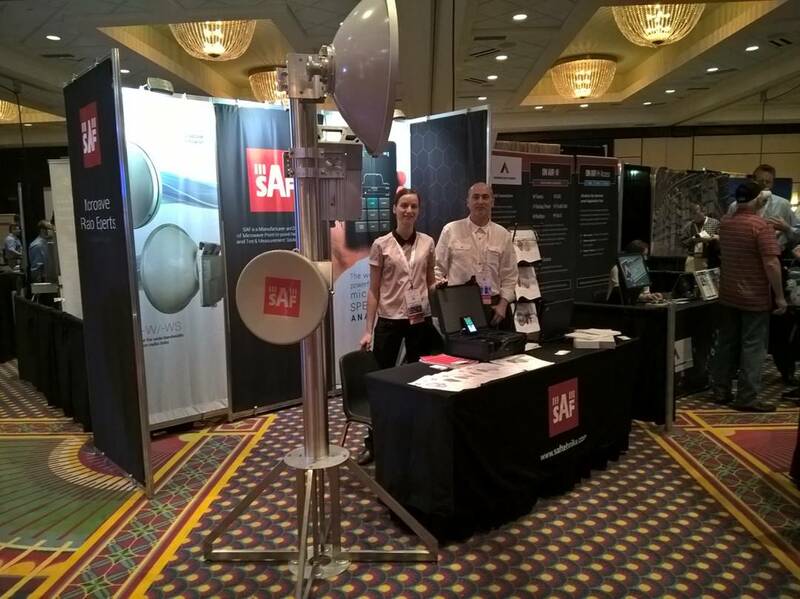 During the exhibition „WISPAPALOOZA 2016” there were presented Integra and Spectrum Compact product series. Visitors of „SAF Tehnika” stand were mainly from different regions of USA and the main interest was about our Integra product serie. Net turnover of the “SAF Tehnika” Group in the 2015/ 2016 financial year was EUR 13.71 million, which is EUR 854 thousand or 6.6% more than in the previous FY 2014/ 2015. The Group closed the FY 2015/2016 with a profit of EUR 926 thousand, which is by EUR 353 less than in previous FY. The difference was largely made by lower revenues from currency fluctuations. “SAF Tehnika” JSC publishes its audited consolidated and non-consolidated financial statements for financial year 2015/2016 (from July 1, 2015- June 30, 2016) according to Section 56th, 5th paragraph of „Law on the Financial Instruments Market” of the Republic of Latvia. “SAF Tehnika” Group consists of SAF Tehnika JSC (hereinafter – the Parent) operating from Riga, Latvia, a wholly owned subsidiaries registered in USA - “SAF North America LLC” and “SAF Services LLC”. Net turnover of the Group in the 2015/ 2016 financial year was EUR 13.71 million, which is EUR 854 thousand or 6.6% more than in the previous FY 2014/ 2015. In the reporting year, the Group continued to work at the research and identification of customer-specific needs by developing and improving the offer of niche products. Additional revenue was drawn from the development of specific customer required functionality of JSC “SAF Tehnika” products. Throughout the world there remains an increased demand for radio systems that provide enhanced data transmission rate and can be enhanced and updated in order to improve data usage. This tendency increasingly determines the direction of new product development both for JSC “SAF Tehnika” and across the markets. Exports made 99.14% of the turnover and amounted to EUR 13.6 million. During the reporting year the Group exported its products to 76 countries worldwide. At the end of the year the Group’s net cash funds balance was EUR 5.91 million. The Group’s net cash flow was EUR 1 591 thousand for the period of 12 months of the reporting year. During the reporting year, the Group invested EUR 456 thousand into IT infrastructure, production and research equipment, purchase of software and licenses, as well as product certification. The Group's financial result for the reporting year 2015/2016 was a profit of EUR 926 thousand. The Parent company’s financial result for FY 2015/2016 was a profit 889 thousand EUR. The Board of the Company suggests that dividends in the amount of EUR 1 million be distributed to shareholders. SAF Tehnika has successfully participated in "EUTC Annual Conference 2016"
According to the agreement No. SKV-L-2016/152 concluded between „SAF Tehnika” JSC and government institution „The Investment and Development Agency of Latvia” of a project „Participation of „SAF Tehnika” JSC in international exhibitions”, on 27 - 30 September, 2016 the company exhibited at "EUTC Annual Conference 2016" which took place in Frankfurt, Germany. 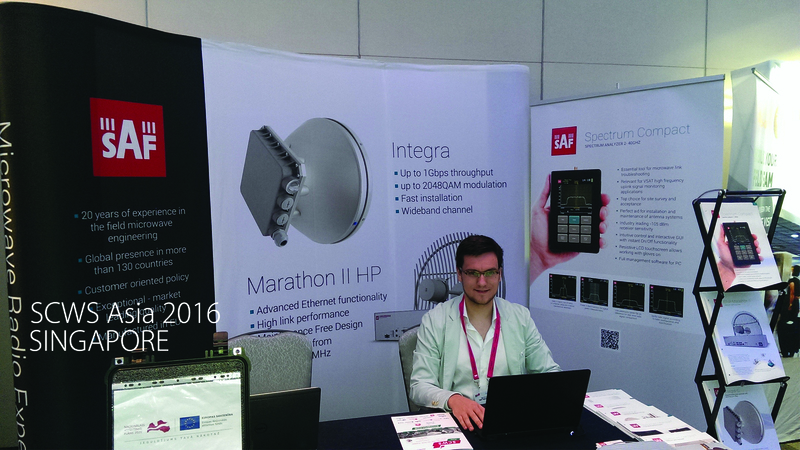 During the exhibition „EUTC Annual Conference 2016” there was presented Spectrum Compact spectrum analyzer, Integra product series and CFIP Marathon II. Visitors of „SAF Tehnika” stand were mainly from Germany and other parts of Europe. SAF Tehnika has successfully participated in "Telecom Infra event 2016"
According to the agreement No. SKV-L-2016/152 concluded between „SAF Tehnika” JSC and government institution „The Investment and Development Agency of Latvia” of a project „Participation of „SAF Tehnika” JSC in international exhibitions”, on 15 September, 2016 the company exhibited at "Telecom Infra event 2016" which took place in De Fabrique Utrecht, Netherlands. 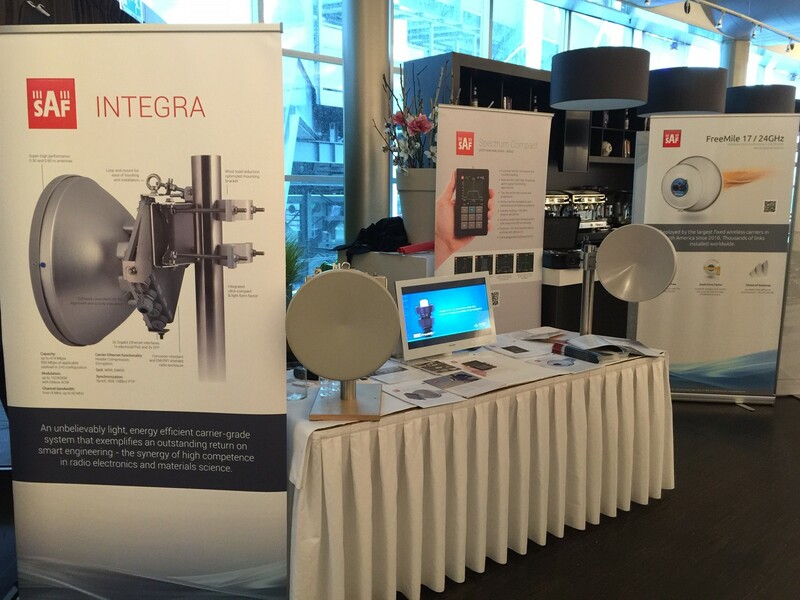 During the exhibition "Telecom Infra event 2016" there were presented Integra product series, Spectrum Compact product series and FreeMile 17/24 radio. Visitors of „SAF Tehnika” stand were mainly from Netherlands and the main interest was about our Integra product series. SAF Tehnika has successfully participated in "CCA Annual Convention"
According to the agreement No. SKV-L-2016/152 concluded between „SAF Tehnika” JSC and government institution „The Investment and Development Agency of Latvia” of a project „Participation of „SAF Tehnika” JSC in international exhibitions”, on 20 - 22 September, 2016 the company exhibited at "CCA Annual Convention" which took place in Seattle, Washington, USA. During the "CCA Annual Convention" there were presented Spectrum Compact product series, Integra product series and CFIP PhoeniX C radio. Visitors of „SAF Tehnika” stand were mainly from different regions of USA. SAF Tehnika has successfully participated in "IBC 2016"
According to the agreement No. SKV-L-2016/152 concluded between „SAF Tehnika” JSC and government institution „The Investment and Development Agency of Latvia” of a project „Participation of „SAF Tehnika” JSC in international exhibitions”, on 9 - 13 September, 2016 the company exhibited at "IBC2016" which took place in RAI Amsterdam, Netherlands. During the exhibition "IBC 2016" there were presented Spectrum Compact product series, Integra product series and CFIP PhoeniX C radio. 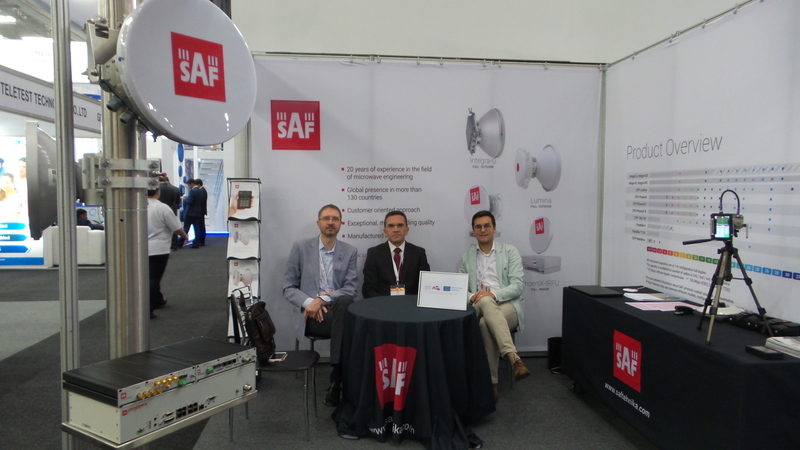 Visitors of „SAF Tehnika” stand were mainly from Netherlands and the main interest was about our Integra product series and CFIP PhoeniX C radio. Our latest CFIP Lumina update includes management data buffering fix, as well as other significant features. To get the latest firmware update, please visit the downloads section on our web (you must be logged in). Additionally, two minor firmware updates are available for Integra-S, Integra-G, Integra-GS and an out-of-band management update for Integra-W & Integra-WS. The full changelog can be found in the txt. file inside each zip archive file. NB! Please contact our tech support for any further assistance. We are proud to announce that we have become official members of ISPA (Austria) and ASUT (Switzerland). Internet Service Providers Austria (ISPA) is a part of a larger European association EUROISPA and their main function is broadband development and planning in Austria. ASUT's focus is towards Information Communication Technologies. Our services are more efficient than ever! SAF Path Calculator is one of our biggest web upgrades to date offering the user a variety of features. The intuitive interface and precise calculations allow you to receive the essential details on a planned project immediately. Just by filling in the address or dropping the pins on the map, you can get an instant link calculation. SAF's Path Calculator currently operates in the late Beta version and is available on our Partner Portal, and for registered users only. Check out SAF's Path Calculator. Last month our annual Global Sales Meeting took place in SAF's headquarters in Riga. The meeting brings together our sales agents and colleagues from all over the world. During the three-day event that was packed with valuable presentations, discussions, and workshops we focused on our plans for the next year. See more photos of the event. While you are at it, feel free to give us a follow and like our page. As a part of the Latvian national booth, we will be participating in this year's GITEX technology week, the third biggest technology event in the world that takes place in Dubai, UAE. During the event, we will present our latest innovations. For Q4 of the FY 2015/2016, the Group’s unaudited consolidated net turnover was EUR 3.67 million, which is by 14% or EUR 0.44 million more than in Q4 of the FY 2014/2015, and by 22% more than in Q3 this year. The Group finished the closing quarter of the FY 2015/2016 with profit of EUR 573 thousand (unaudited), that is by 226 thousand more than in Q4 of the previous financial year. The unaudited consolidated result for the FY 2015/2016 is the profit of EUR 925 thousand. The major part of the Q4 turnover (57% or EUR 2.1 million) was made by sales in North/Latin Americas and was related to the development of data transmission solutions and products tailored to specific customer needs. This region’s result is by 36% greater than in Q4 last year and exceeds the result in Q3 by 56%. The European and CIS region gave 34% of the turnover in Q4. The region’s turnover decreased by 11% as compared to the same quarter of the previous FY, but was by 2% higher than in Q3. The above fluctuations are due to implementation of individual projects. The Group’s products were sold in 49 countries during the reporting quarter. The Group finished the closing quarter of the FY 2015/2016 with profits of EUR 573 thousand (unaudited), which is by EUR 226 thousand more than in Q4 of the previous financial year. The Group’s unaudited consolidated turnover for the financial year 2015/2016 was EUR 13.7 million, which is a 7% increase compared to revenues of the previous financial year. The unaudited consolidated result for the FY 2015/2016 is the profit of EUR 925 thousand, which is by EUR 353 thousand less comparing to the Group’s result of the previous financial year when the profit was EUR 1.28 million. The Group had a positive net cash flow during 12 months of the FY, equaling to EUR 1.59 million. As of the end of the reporting period, the Group’s net cash balance was EUR 5.9 million. This financial year SAF Tehnika received EUR 0.46 million co-financing from EU funds to support product development and marketing activities. During this period EUR 435 thousand have been invested in fixed assets. Important news for all Integra users, we recommend getting acquainted with V3.1.18 and V3.1.21 upgrades. A firmware upgrade V3.1.21 is available for Integra, Integra-S, Integra-G and Integra-GS. The upgrade for Integra, Integra-S, Integra-G and Integra-GS includes variable power, duplex shift change for 17/24GHz in Web GUI, updated ACM profiles system stability improvements, new performance sensors, protection against traffic flood attacks and more. To access these upgrades, please go to the 'Downloads' section on our website (you must be logged in). The full changelog can be found in the .txt file. Note! Please read the instructions before installing the latest firmware. If you have any questions, please don't hesitate to contact your SAF manager or SAF Tech support (techsupport@saftehnika.com) before installation. Our training course offers the absolutely best training experience for SAF's highly acclaimed Integra series products. The next SAF training will take place in Las Vegas on October 10th, 2016, and will be led by our most skillful professionals who've been a part of our company for many years. All early birds will get a 10% discount when entering the code "WISPAtraining16" upon registration.The number of places is limited. We hope to see you there! Amongst many exciting locations where our products are in use, it is safe to say that an offshore wind farm in the North Sea is one of the most challenging ones. High wind speeds and extremely salty weather conditions require durable products. That is why IT Company GmbH uses SAF products to connect an offshore wind farm that is operated by E.ON Climate and Renewables. 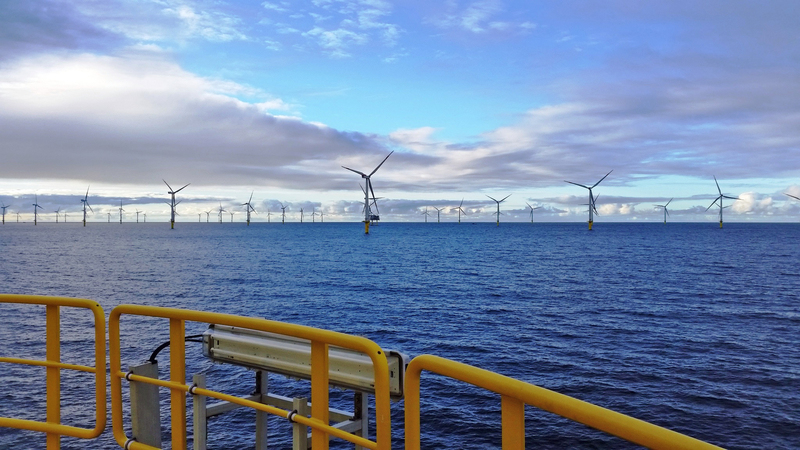 If you want to learn how SAF Phoenix M helps to connect an offshore wind farm, read our latest case study. We are proud to say that SAF has been chosen to represent the Baltic pavilion in the Venice Biennale of Architecture 2016. The exhibition is dedicated to architectural achievements from different countries and regions. In the Baltic pavilion, you can find many installations from Latvia, Lithuania, and Estonia and in the center - a tower with our radios on top. The event will take place till November 28th, 2016 so we encourage you to visit the biennale if you happen to be in Venice. 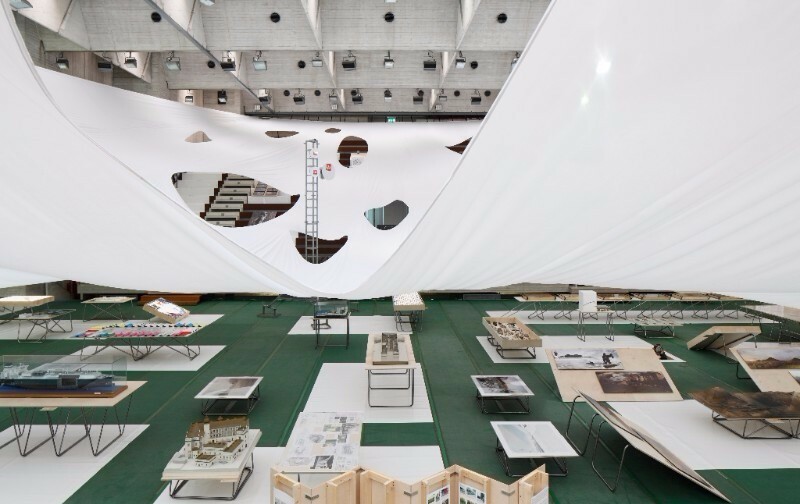 Learn more about the Baltic pavilion and its installations. Fun fact: the Baltic pavilion has been listed in the TOP 10 of must-see places to visit during the event. Mark your calendars, because here are some of the events that we will be attending in fall. On September 9th we will be exhibiting at IBC in Amsterdam, Netherlands. Shortly after that, on September 20th, you can meet us in Seattle WA, USA where we will be participating in CCA, but if you happen to be in Toronto that week, you can also spot us at UTCC. To finish off this busy month, we will be exhibiting at EUTC Annual Conference in Frankfurt, Germany on 27th of September. Visit our website to get the list of our upcoming events. Mark your calendar for October 10th, as we are offering a unique experience to learn all there is to know about the Integra series products. This course will provide an overview of these products and give you hands-on lab experience using Integra RF link. After successful completion of the course, you will receive an official SAF certificate. Read the full agenda and register here. If you ever wondered why E-band usage is on the rise, be sure to check out the latest issue of Microwave Journal to learn more about it and the newest addition to our product family - E-Band Spectrum Compact. More information about the device and its applications is available in this brief product summary. Also be sure to watch, like and share our Spectrum Compact video tutorials on our YouTube channel. Expo season is slowly approaching the relaxing summer mode, so we want to say a big thank you to everyone who paid us a visit in any of this year’s events. 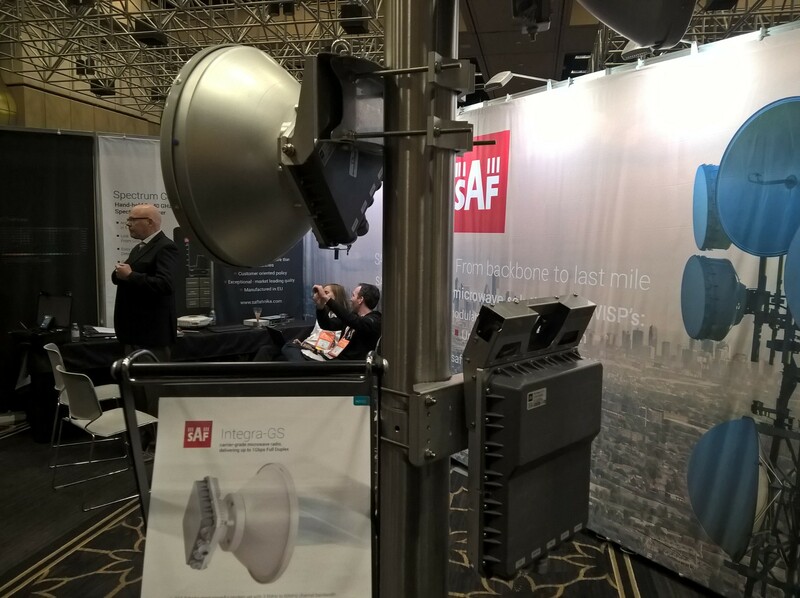 It was great seeing so many people interested in our new E-band Spectrum Compact at the IMS event, and to exhibit our products at Critical Communications World in Amsterdam. We are currently in preparation for ANGACOM. The event takes place in Cologne, Germany and is amongst Europe's leading broadband operator events. We'll be presenting our products together with FMS, our long term German partners. The main focus will be on Integra, Lumina and Spectrum Compact. 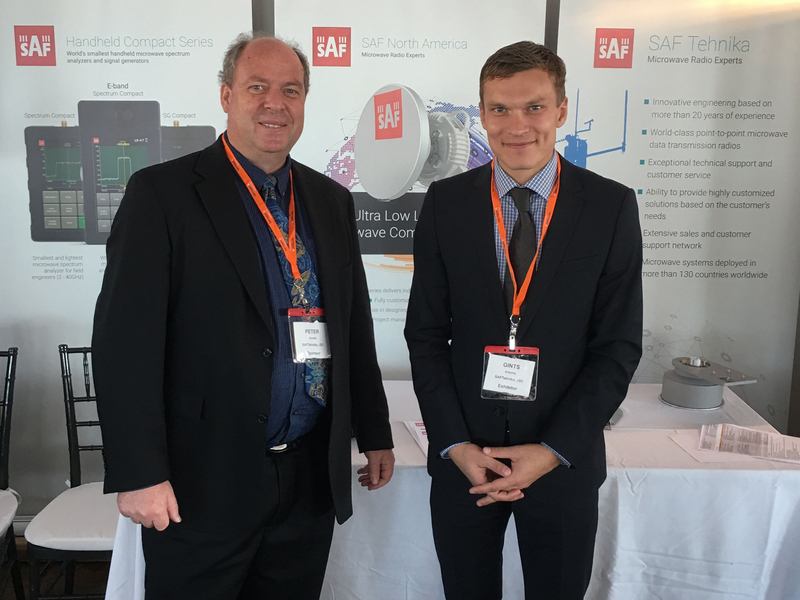 SAF will be represented by Gints Antoms, Sales Director for the European region, and Matthias Kaiser, Sales Manager for DACH region countries. Here is a great photo of an offshore wind farm installation that stays connected using our products. Please follow the information that is listed below the image to learn more about how to get featured in our newsletter. According to the agreement No. SKV-L-2016/152 concluded between „SAF Tehnika” JSC and government institution „The Investment and Development Agency of Latvia” of a project „Participation of „SAF Tehnika” JSC in international exhibitions”, on 03 - 06 May, 2016 the company exhibited at "UTC TELECOM & TECHNOLOGY 2016" conference which took place in Denver, Colorado, USA. During the "UTC TELECOM & TECHNOLOGY 2016" conference there were presented Spectrum Compact product series, Integra product series and CFIP PhoeniX-C radio. Visitors of „SAF Tehnika” stand were mainly from different regions of USA. All the latest company news in one place! Microvawe or fiber? The lifelong question that faces almost everyone who plans a major network upgrade. To avoid high cost and long installation time, our client Buzcom, a WISP in England, chooses our products. 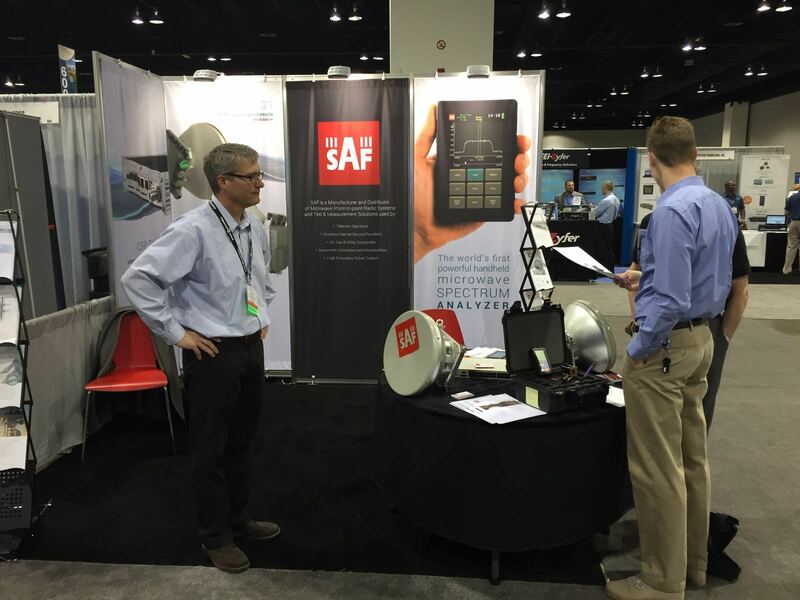 Read our case study to learn more about how SAF can help you with the wireless network upgrade - from link planning to installation. The long wait is over - we are proudly introducing an upgraded and more powerful Integra series of microwave radios - Integra-G and Integra-GS. Main differences include modulation support of up to 2048 QAM, the most powerful modem yet with 3.5MHz to 60MHz channel bandwidth and other universal upgrades all wrapped up in our sleek Integra design. Read more about it. Be sure to watch this video about our SG Compact signal generator. Who said that size matters? 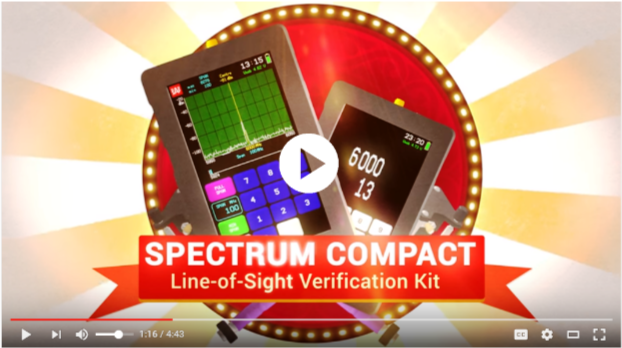 Spectrum Compact & SG Compact are the smallest such devices in the market, but they offer big solutions. Spectrum Compact & SG Compact have many applications, one of which is verification of line-of-sight before link installation. Be sure to check out all the other episodes on our YouTube channel. Feel free to subscribe. For Q3 of the FY 2015/2016, the Group’s unaudited consolidated net turnover was 3.03 million EUR, which is by 10%, or 0.2 million EUR, more than in Q3 of the FY 2014/2015, but by 12% less than in Q2 this year. The Group closed Q3 of the FY 2015/2016 with the loss of 251 thousand EUR (unaudited). The unaudited consolidated result for 9 months of the FY 2015/2016 is the profit of 353 thousand EUR, which is by 578 thousand less, comparing to the Group’s result of 9 months of the previous FY 2014/2015 ( when the profit of 932 thousand EUR was largely made by revenues from currency fluctuations). For Q3 of the FY 2015/2016, the Group’s unaudited consolidated net turnover was 3.03 million EUR, which is by 10%, or 0.2 million EUR, more than in Q3 of the FY 2014/2015, but by 12% less than in Q2 this year. The major part of the turnover in Q3 (45%), or 1.35 million EUR, was made by sales in North/Latin Americas, which is by 38% less than in Q2 this year. This region’s result is by 4% worse than in Q3 last year. The European and CIS region gave 41% of the turnover in Q3. The region’s turnover increased by 35% as compared to the same quarter of the previous FY and Q2 this year. The Group’s products were sold in 47 countries during the reporting quarter. Revenues of the reporting period were less than planned, which resulted in a negative profit before taxes and interest payments – 61 thousand EUR and the Group closed Q3 of the FY 2015/2016 with the loss of 251 thousand EUR (unaudited). The falling USD/EUR exchange rate at the end of March also gave a negative impact on the Group’s activity net result. For 9 months of the FY 2015/2016, the Group’s unaudited consolidated turnover was 10 million EUR, which is a 4% increase compared to revenues at the same period of the previous financial year. The unaudited consolidated result for 9 months of the FY 2015/2016 is the profit of 353 thousand EUR, which is by 578 thousand less, comparing to the Group’s result of 9 months of the previous FY 2014/2015 (the profit of 932 thousand EUR). ). The profit of 9 months of the previous financial year was largely made by revenues from currency fluctuations – 425 thousand EUR. The Group had a positive net cash flow during 9 months of the FY, equaling to 1.34 million EUR. As of the end of the financial year, the Group’s net cash balance was 5.6 million EUR. SAF Tehnika is the company with the long-term competence in development and production of microwave radios. SAF Tehnika will proceed with its work on new high-quality products for the microwave data transmission market, providing not only standardized solutions, but also product modifications in order to meet customers’ special needs, as well as searching innovative ideas for applying microwave data transmission. The Group is financially stable. The goal of the Company is to stabilize sales levels to ensure a positive net result in the long term. Although the result of the reporting period is negative, the Board of SAF Tehnika maintains cautious optimism but cannot provide certain prognosis for sales figures and operational results. According to the agreement No. SKV-L-2016/152 concluded between „SAF Tehnika” JSC and government institution „The Investment and Development Agency of Latvia” of a project „Participation of „SAF Tehnika” JSC in international exhibitions”, on 23 - 24 February, 2016 the company exhibited at “TESSCO ONE Innovation Showcase 2016” which took place in University of Phoenix Stadium, USA. During the exhibition „TESSCO ONE Innovation Showcase 2016” there were presented Spectrum Compact product series. Visitors of „SAF Tehnika” stand were mainly from different regions of USA. According to the agreement No. 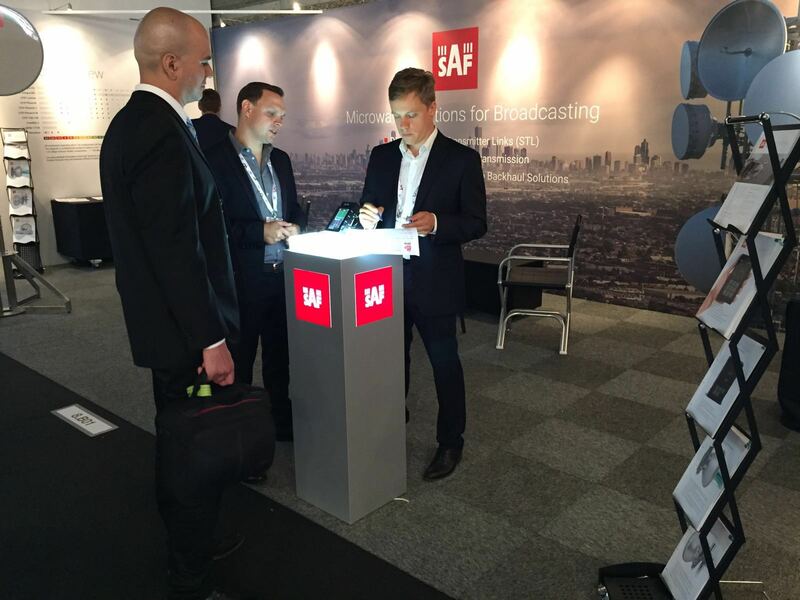 SKV-L-2016/152 concluded between „SAF Tehnika” JSC and government institution „The Investment and Development Agency of Latvia” of a project „Participation of „SAF Tehnika” JSC in international exhibitions”, on 18 - 21 April, 2016 the company exhibited at “NAB Show 2016” which took place in Las Vegas Convention Center, USA. During the exhibition „NAB Show 2016” there were presented Integra, Spectrum Compact product series and CFIP PhoeniX C radio. Visitors of „SAF Tehnika” stand were mainly from different regions of USA and the main interest was about CFIP Phoenix C radio and Spectrum Compact product series. According to the agreement No. SKV-L-2016/152 concluded between „SAF Tehnika” JSC and government institution „The Investment and Development Agency of Latvia” of a project „Participation of „SAF Tehnika” JSC in international exhibitions”, on 15 - 17 March, 2016 the company exhibited at “WISPAmerica 2016” which took place in Louisville Marriott Downtown, USA. During the exhibition „WISPAmerica” there were presented Integra and Spectrum Compact product series. Visitors of „SAF Tehnika” stand were mainly from different regions of USA and the main interest was about our Integra product serie. According to the agreement No. SKV-L-2016/152 concluded between „SAF Tehnika” JSC and government institution „The Investment and Development Agency of Latvia” of a project „Participation of „SAF Tehnika” JSC in international exhibitions”, on 12 - 13 April, 2016 the company exhibited at “SCWS Asia 2016” which took place in Pan Pacific Singapore, Singapore. During the exhibition „SCWS Asia 2016” there were presented Integra, Spectrum Compact product series and CFIP Marathon II HP. Visitors of „SAF Tehnika” stand were mainly from Asia region and the main interest was about our Integra product serie. For Q2 of the FY 2015/2016, the Group’s unaudited consolidated net turnover was 3.45 million euros, which is by 6%, or 0.2 million euros, less than in Q2 of the FY 2014/2015, and by 3% less than in Q1 this year. The Group closed Q2 with the profit of 312 thousand euros (unaudited), which is by 112 thousand euros more comparing to revenues generated in Q2 of the previous financial year. The unaudited consolidated result for 6 months of the FY 2015/2016 is the profit of 605 thousand euros, which is by 119 thousand euros more, comparing to the Group’s result of 6 months of the previous FY 2014/2015 (the profit of 485 thousand euros). For Q2 of the FY 2015/2016, the Group’s unaudited consolidated net turnover was 3.45 million euros, which is by 6%, or 0.2 million euros, less than in Q2 of the FY 2014/2015, and by 3% less than in Q1 this year. The major part of the turnover in Q2 (64%), or 2.2 million euros, was made by sales in North/Latin Americas, which is by 51% more than in Q1 this year because of specific customer needs and development of tailored solutions and products for data transmission. This region’s result rose by 38% as compared to Q2 of the previous year. The Group’s products were sold in 49 countries during the reporting quarter. The Group closed Q2 of the FY 2015/2016 with the profit of 312 thousand euros (unaudited), which is by 112 thousand euros more comparing to revenues generated in Q2 of the previous financial year. For 6 months of the FY 2015/2016, the Group’s unaudited consolidated turnover was 6.85 million euros, which is a 2% increase compared to revenues at the same period of the previous financial year. The unaudited consolidated result for 6 months of the FY 2015/2016 is the profit of 605 thousand euros, which is by 119 thousand euros more, comparing to the Group’s result of 6 months of the previous FY 2014/2015 (the profit of 485 thousand euros). It should be noted that the profit of the first half of the previous financial year was largely made by revenues from currency fluctuations. The Group had a positive net cash flow during 6 months of the present FY, equaling to 1.482 million euros. As of the end of the reporting period, the Group’s net cash balance was 5.8 million euros. In December 2015, dividends were paid in the amount of 0.34 euros (thirty four cents) per share, or 1.009 million euros in total. SAF Tehnika is the company with the long-term competence in development and production of microwave radios. 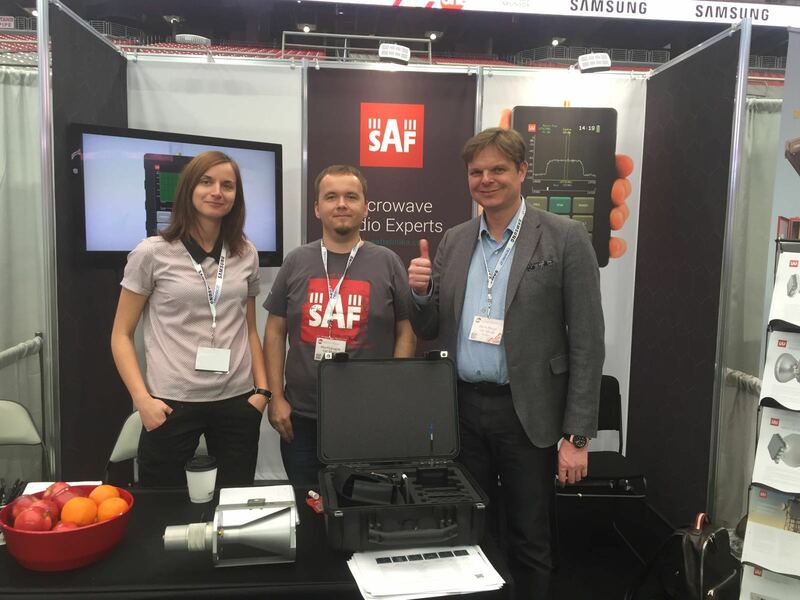 SAF Tehnika will proceed with its work on new high-quality products for the microwave data transmission market, providing not only standardized solutions, but also product modifications in order to meet customers’ special needs. The Group is financially stable. The goal of the Company is to stabilize sales levels to ensure a positive net result in the long term. Although the result of the reporting period is positive, the Board of SAF Tehnika cannot provide certain prognosis for sales figures and operational results.